We’ve said it once, and we’ll say it again - we have the best backyard on earth. British Columbia is home to some incredible natural and man-made attractions and landscapes, accessible via train, plane, and ferry - but the automobile is still king of the sightseeing throne. 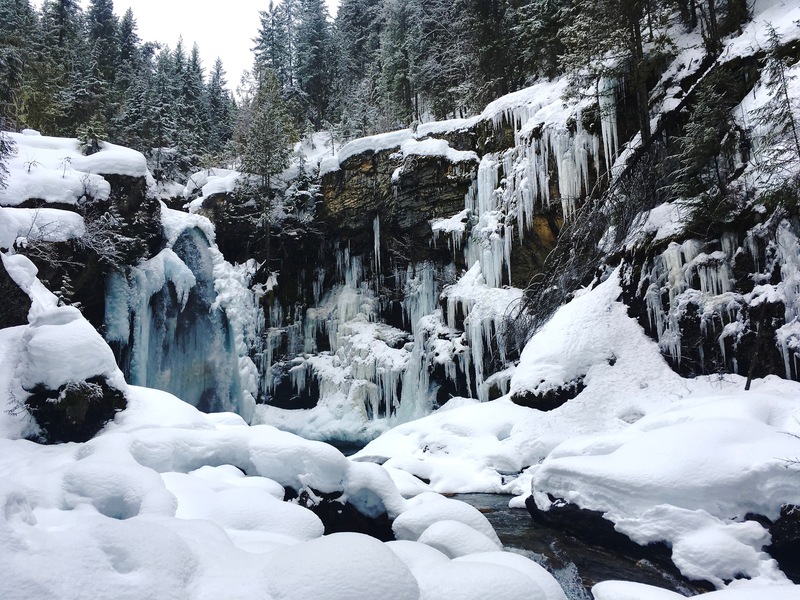 Wintertime in BC means getting outside to enjoy some of the best winter locales this side of the equator, and to explore our environment in all of its glory. In this post, we’re counting down 5 of the best winter road trips in British Columbia that deserve your patronage. This is not your average Canadian weather. Storm-watching has become big business in Canada’s un-official surf and ocean playground mecca, Tofino. 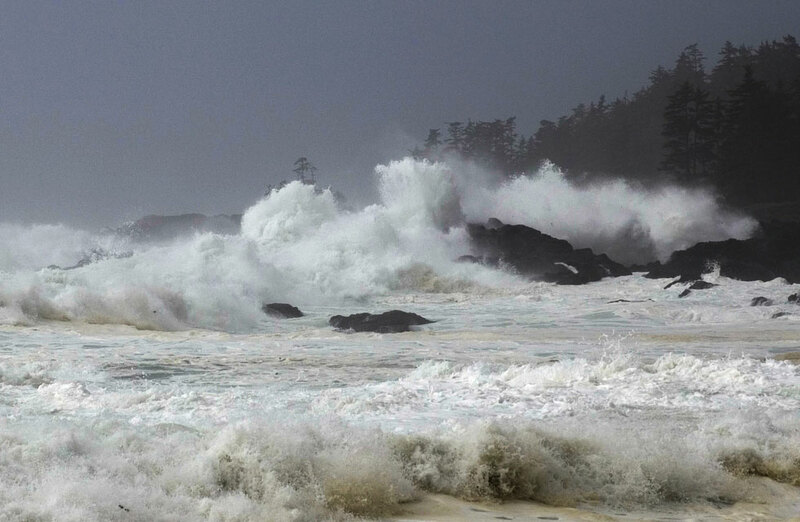 The little Vancouver Island town is home to some of the biggest surf, harshest winds, and wildest rain storms this side of the prairies. The weather here is accentuated by the temperate coastal rainforest that elevates winter temperatures to an average of 8 degrees Celsius. The exposed coastal location of the island community of 1900 people is a hotbed for storm-watching activities thanks in part to having no substantial landmass between Vancouver Island and Japan. This location gives Tofino a unique vantage point and puts storm-watchers in the face of 20-foot waves and ever-accelerating oceanic winds. To get to Tofino, take the Trans Canada highway north through Mill Bay, Duncan, and Nanaimo until you veer west through the heart of the island to Port Alberni. Continue west past Sproat Lake and just below Clayoquot Plateau Provincial Park. At Ucelet, turn north on Highway 4 through the Pacific Rim National Park. This forested, winding road adventure immerses you into the beautiful landscapes before you even get to Tofino! From Victoria, the drive lasts a solid 4.5 hours - from Vancouver, add an hour for the ferry ride from Horseshoe Bay that brings you into Nanaimo. Situated in the Fitzsimmons Range of the Coast Mountains of BC, Whistler Blackcomb lies on the northwestern edge of Garibaldi Provincial Park and reaches an elevation of 7,156 feet. The world-famous ski resort has ranked consistently as one of the world’s best skiing and snowboarding destinations since the 1990s and was home to part of the 2010 Vancouver Winter Olympics. With over 200 marked trails and boasting a rideable tenure of 4,757 acres, Whistler is visited annually by over two million people who come for its annual average snowfall of over 33 feet. If snowboarding and skiing aren’t your things, the world famous Peak 2 Peak Gondola can show you the slopes from the sky. Reaching Whistler is a dream road trip as well; head north on the Sea to Sky Highway 99, alongside the picturesque and idyllic Howe Sound, taking about 1.5 hours from start to finish. Nestled along the infamous Powder Highway, Revelstoke lies in southeastern BC, on the banks of the Columbia River, about 640 km east of Vancouver. 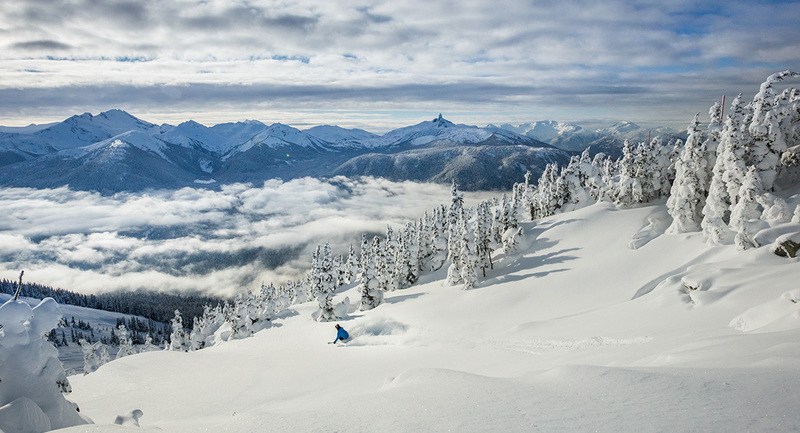 The city of Revelstoke offers access to some of the best skiing and riding conditions on earth – with an annual snowfall measuring 40-60 feet - but winter sports aren’t the focus of this adventure. You can also explore the incredible hiking and waterfalls in the Mount Revelstoke and Glacier National Park area. Hiking in wintery Revelstoke means less trail congestion on the immaculate Soren Sorenson 2k and 5k loops in Mount Revelstoke National Park - and if you’re feeling gutsy, hike the summit to Caribou Canib for an awesome bonfire with a view. This trip is a big one, representing about 6 hours of road time - but you’ll traverse some of the most breathtaking landscapes of BCs interior. 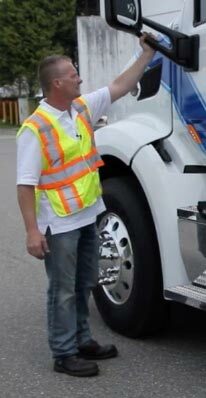 From Vancouver, take the Trans Canada east to Abbotsford, and veer north on Highway 3 to access Kamloops. Continue on the Trans here through Salmon Arm and over the Columbia. Winter is cold. Snow is cold. Canada is cold. The Kootenay Rockies Hot Springs Tour is not. 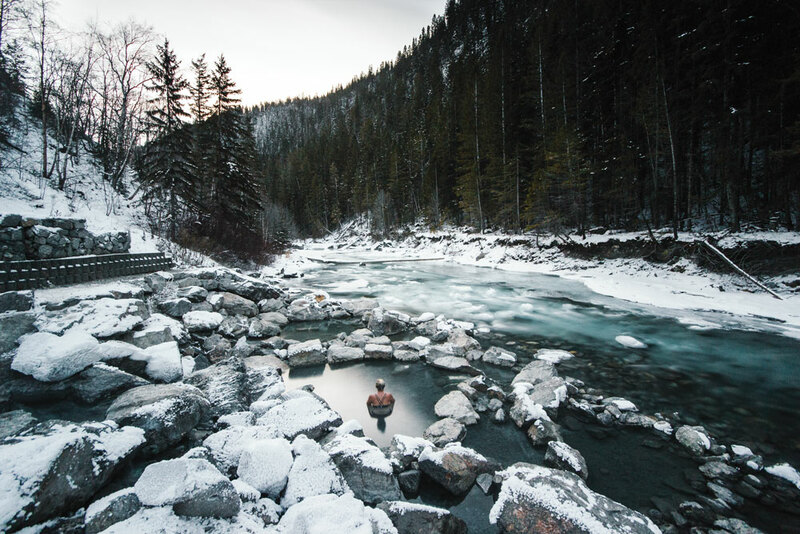 Home to numerous resort-style hot springs and a wealth of backcountry hot spring locations, the Kootenay’s and its communities help visitors enjoy these natural winter escapes through a variety of exciting packages and adventure trails. The Hot Springs Route begins in Cranbrook and Kimberley, the business center of the area as well as home to one of Canada’s largest municipal parks. From here, head north of Highway #93/95 through three hot spring locations (Lussier, Fairmont, and Radium Hot Springs) - a 157km trek. Next, follow Hwy 95 to Golden, BC and west on the Trans Canada Highway through Glacier National Park to Canyon Hot Springs Resort with its 2 natural mineral hot pools, one at 40C (104F) and a swimming pool at 26C. From Canyon Resort in Revelstoke, take Hwy #23 south to the Shelter/Galena Bay ferry and onto Halcyon Hot Springs Resort, located alongside Upper Arrow Lakes. Halcyon Resort features four mineral-rich natural hot springs, each at a different temperature. This is a place of wellness and recreation with adventure activities, a spa, restaurant, and accommodation - while Halfway River Hot Springs are back-country natural pools located off Halfway River road (although access is via some rough roads; check the road conditions prior to leaving). The kid in all of us loves to explore new landscapes and do things our adult selves wouldn’t dream. 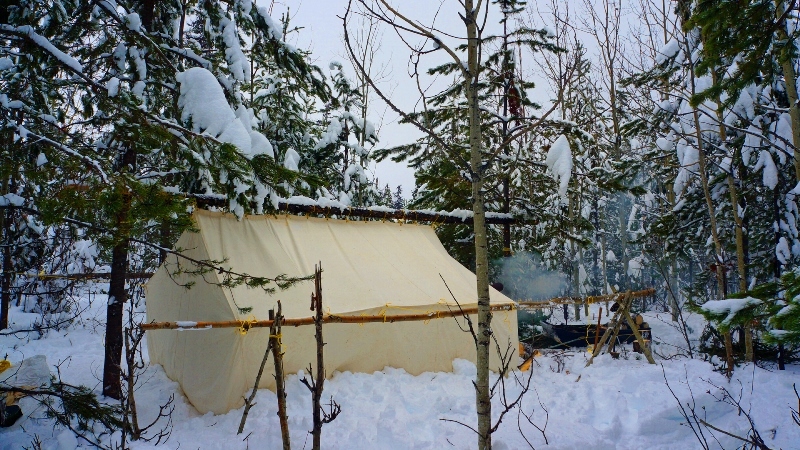 Cue winter camping. Prince George is a BC favourite in terms of access to the great outdoors, and those northerners know how to take advantage of their location well into the winter months. 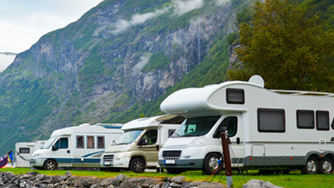 Many of the areas campground and RV parks are accessible and open for business year round and can accommodate just about any camping desire you have. From being close by the highway and a visitors center, or back in the bush with nothing but the snow and the elements to keep you company, Prince George has it all! To get there, be prepared to spend at least a long weekend to accommodate the scenic drive. Take the Trans Canada highway east from Vancouver and north at Hope to Cache Creek. From here, continue north on Highway 97 past Williams Lake, following the Fraser River nearly the entire way. In Canada, winter is more than just hunkering down like a bear and waiting until spring comes back to save us from the snow and ice. It’s about exploring and enjoying the landscape, and experiencing the moments and views between our destinations. There’s a lot to see in this province of ours and doing that via car is a fantastic way to get your fix of beautiful British Columbia this winter. Enjoy!